The Chin has spoken. Bruce Campbell officially decided to retire as Ash Williams following the cancellation of Ash vs. Evil Dead by Starz, a decision that still isn't sitting particularly well with fans. Even so, this is Hollywood and, as they say, the show must go on, especially in an age when reboots, remakes and everything of the sort are hot ticket items. So, even without Campbell on board, it's likely Evil Dead will continue. So how does he feel about that idea? Bruce Campbell is reasonably active on social media and will, from time to time, answer fan questions. Recently, someone asked about the producers and actors from Ash vs. Evil Dead and if he would give them his blessing if they wanted to carry on that universe without him. The actor graciously did indeed give them his blessing. Here's what he had to say about it. "Not that they need it, but of course. 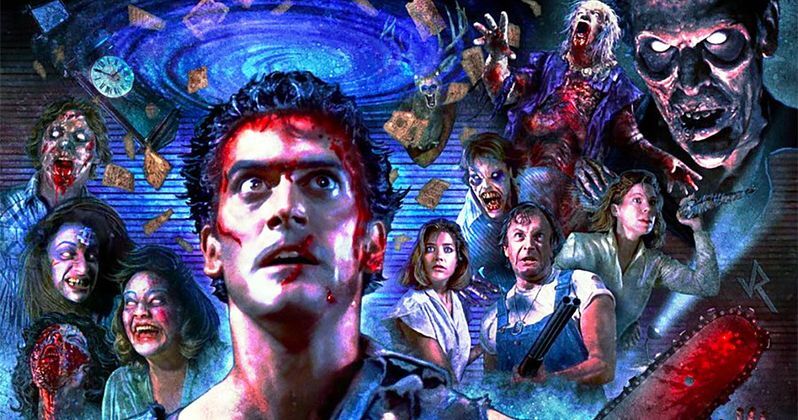 Lots of unexplored stories and crossovers in the Evil Dead universe. #nextgen." Fede Alvarez made a remake, that may or may not exist in the actual Evil Dead universe as we know it, in 2013. Bruce Campbell was heavily involved as a producer and showed in a post-credits scene, but he wasn't really in the movie. So the idea of movies or shows being made in that universe without him has kind of been explored already. However, he wasn't officially retired as Ash at the time and, even if it was for the briefest of moments, he did appear as Ash on screen. That does make a big difference. With that being said, it may be difficult for some fans to see the franchise carry on knowing that Campbell is retired. Even though Ash vs. Evil Dead season 3 just wrapped up, we already know what a continuation could look like. What we know for sure is that the series won't continue, so don't get your hopes up on that end. Fede Alvarez recently ran a Twitter poll asking if he should do Don't Breathe 2 or an Evil Dead 2 remake. Overwhelmingly, people chose Evil Dead 2. So maybe he's trying to get that going? Producer Rob Tapert also recently said that he and Sam Raimi "have been talking about what a new incarnation would be." With all of that in mind, it's hard to believe that we've seen the last of Evil Dead, be it on the big or the small screen. It's tough to think about seeing these projects knowing that Ash isn't a part of it, but that's how it has to be. That is, unless something changes Bruce Campbell's mind, but he seems firm in his decision at this point. Even so, he's being gracious about it and providing his blessing. He says they don't need it, but they are surely happy to have it. You can check out Bruce Campbell's tweet for yourself below.